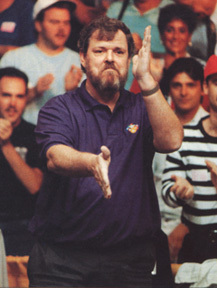 1991 U.S. Open 9-Ball Championship . Sept. 8, 1991 . Chesapeake, Va. The teacher-student clich� lends itself to pool: Young, energetic upstart outgrows the lessons of some crotchety old-timer to become something greater than the mentor could ever be. Remember "The Color of Money"? Well, the final of the 1991 U.S. Open 9-Ball Championship is proof that that crafty veteran might not give in so fast. Dennis Hatch, a 20-year-old rising star on the professional circuit, lost a hill-hill heartbreaker to Buddy Hall, his former pool schoolmaster. Early on in the race-to-9, it looked like luck - at least in this match - favored experience over youth. Facing a 5-3 deficit, Hall won two of the next three racks, both times benefiting from "missed" shots that found a pocket through a fortunate carom or two. In front of ESPN cameras, Hall then reached the hill, 8-7, only to be joined by Hatch a game later. Hatch stood in front of a deathly silent crowd staring at the Gold Crown III, a break-and-run from one of the most coveted titles in pool. The young gun from Buffalo, N.Y., unloaded one of his cannon-powered breaks. Not only nothing, but the balls raced around the table to arrange themselves in perfect order for Hall. After the match, Hatch admitted he knew it was all but over with the table that open. "I hit the break shot pretty good," he said. "But when I saw the results, my first thought was, 'Maybe next time.'" Hatch joined the crowd in a standing ovation for the Hall of Famer. "When I saw that table," Hall said, "I thought the exact same thing everyone in the room thought - what a road map! It was perfect."